During Saturday evening’s Windy City/Charm City game at East Coast Extravaganza, something happened that’s going to spur a lot of talking about the rules of roller derby. In a power jam during the first half, Windy City took “strategy” to the extreme and did something that could potentially set a horrible precedent for derby. Near the end of the previous jam, the Charm City jammer found herself sent to the penalty box. This gave Windy City a power jam with a lot of time on it during the jam in question. There were no blockers in the penalty box. (At least, that’s how I remember seeing it; the number of blockers in the box is actually unimportant in the scenario that unfolded here.) Before the start of the jam, Charm City’s blockers took their normal positions at the pivot line. However, instead of the Windy City blockers joining them as normal, they decided to venture into the great unknown and all lined up a few feet behind the jammer start line. You know how sometimes a blocker will intentionally start out of position in order to gain an intentional fourth minor penalty? Same deal, except this time, all of the blockers were starting there. When the jam started, a no-pack was called immediately, due to there being no single group of blockers consisting of members of both teams. Charm City’s blockers were immediately called out of play, and looking a little confused as what to do, they watched helplessly as Windy City’s jammer skated through all four of them to pick up the easiest lead jammer call in the history of roller derby. As she skated on by, Charm City could not have legally blocked her since they would have received out-of-play penalties for doing so. Meanwhile, the Windy City blockers were collectively held responsible for committing an illegal procedure penalty. It just so happens that this was one of the no-minors beta test bouts, so instead of all of the Windy blockers being issued minor IP penalties as what would have normally happened, the one skater deemed responsible for causing the no-pack situation was issued a major instead. Since no one skater could have been singled out in that position, the pivot was issued the penalty and sent off, as per rule. After the penalty was issued, the pack needed to be reformed. As the Windy jammer was about halfway around the track on the first lap, Charm realized that they needed to skate forward to reform the pack, as the positioning of the Windy City blockers technically put the Charm City half of the pack 100 feet behind the “front” of where the pack should be. Meanwhile, Windy was under no obligation to skate backwards to reform the pack, although they could not skate forwards for fear of getting failure to reform penalties. So they stood still while they waited for Charm to catch up to them. Here's a visual of how the start of this jam went down, which was a power jam for Windy City: 1) Before the start whistle, all the Windy City blockers lined up behind their jammer, as if to take intentional minor penalties. Charm City blockers lined up normally. 2) At the start of the jam, the position of the blockers immediately created a no-pack situation. Windy's pivot was issued a major penalty for illegal procedure (since this was a no-minors test game). 3) However, although Windy's illegal action was correctly penalized, Charm City was immediately put into a disadvantageous position, giving Windy City lead jammer without their blockers needing to make contact with a single opponent. Once the pack reformed and got back up to speed, the positioning and pace of the pack was a lot like it would have been had blockers from both teams lined up normally and started normally. The key difference was Windy City traded an intentional major penalty in order to instantly guarantee lead jammer status. Consider the position Charm City was left in. They legally lined up on the pivot line, but due to the intentionally illegal action of the Windy City pack, Charm was immediately and unfairly put into a disadvantageous position through no fault of their own. As they were out of play (all blockers are out of play during a no-pack situation), had they tried to slow down or impede the Windy City jammer from skating by them and claiming lead jammer, Charm City would have been called for penalties. So Charm could have sprinted away to prevent the Windy jammer to pass them immediately. And yes, one of Windy’s blockers correctly got a penalty and was sent off for their actions. However, being out of play, the Charm blockers would have had to let the Windy jammer go anyway had she caught up to them within that first lap, or else Charm blockers would start getting blocking out of play penalties (as blocking need not include contact). That doesn’t seem fair at all to Charm City, does it? This sequence of events goes beyond “strategy” and into “silliness.” I don’t know if people are starting forget, but roller derby is supposed to be a contact sport. That generally requires teams to contact each other and physically push them out of the way if they want to gain positioning or get what they want. For modern roller derby, there sure seems to be a lot of ways for a team to get lead jammer or make it easier to score points on individual skaters without having to contact them. This doesn't look good at all for the guy on offense, does it? There's a reason why 4-on-1 situations in sports are hopeless for the one going up against the many. Yet somehow, there are plenty of ways to take deliberate penalties in roller derby (for strategy's sake, of course) to make the four go away without needing to do anything at all. Think about contact sports, in general. Can you think of a situation where one player can easily get by four opponents on the other team? Is a football player going to get through a wall of four opposing tacklers without some help from his teammates? Can one hockey player easily skate around four players by himself and score an easy goal? In fact, is there any 4-on-1 game situation, in any sport, where the “one” has an advantage? Of course not. In contact sports, the only way to get past your opponents is have your teammates physically move them aside or otherwise help you get around them. That’s why 4-on-1 situations, or even 2-on-1 situations, are bad for the “one,” since the other team’s strength in numbers would normally overwhelm the single actions undertaken by the individual. You need a team effort to persevere in a team game. But in roller derby, there’s a way for a team to get something of value by not making any contact whatsoever with the other team, while simultaneously making it illegal for the other team to prevent them from doing anything about it. This is the case if the the actions are unintentional, such as if the team of two blockers in a 4-2 pack trip over each other or get blocked out of bounds, a no pack is called and their jammer can skate through untouched for points; or if the actions are intentional, and a penalty is deliberately taken in order to cause a no-pack and get lead jammer. I won’t go into great detail as to what happened in this video, as I’ve already done that in in Chapter 5 of The Pack Problem. Something that extreme can also happen in flat track derby, as I forewarned in Chapter 7, so it’s not only a banked track issue. Either way, it should be pretty clear why having these kind of strategy options is bad for derby. The only way to get rid of them is to address and correct the fundamental flaw in the rules of the modern game. The most important and critical rule that makes roller derby work is the rule that defines the pack. The pack is where the majority of the skaters are, the pack is what the jammers need to pass through to become eligible to score, and the pack is where jammers score their points on a scoring pass. So yeah, it’s kind of a big deal. Modern derby’s current rules (flat track and banked track) dictate that the pack must have players in both teams in it, and that both teams are responsible for keeping the pack together. If they don’t do that, they get penalized. When both teams play along and do their best to keep the pack together, then derby works just fine. Skaters fight for position within the pack, blockers block each other and clear the way for their jammers, play offense and defense at the same time, and all that jazz. But when one team doesn’t want to keep the pack together, intentionally or otherwise, things start falling apart. Windy City didn’t want to keep the pack together at the start of their power jam against Charm City. As a result, they gained an immediate and almost insurmountable advantage from it. Apparently, this sends the message that top-tier derby teams are okay with taking an intentional major penalty in order to gain a positional advantage during a power jam, lining up in an illegal way for the sake of strategy. So what’s stopping other teams from seeing that, realizing that there are situations where doing it make sense, and start taking the occasional major penalty for strategical purposes? They are already are taking strategical minor penalties, right? And who’s to say a team can’t start taking intentional major penalties in order to deliberately cause a no-pack situation, allowing their jammer through to skate through the opposition for a free, easy, and instant five-point pass, all for the sake of strategy? That’s the flaw with the rules of roller derby, both flat track and banked track: The pack definition rule only works on the honor system. Although penalties are issued to individuals who deliberately destroy the pack, the team committing the penalty can benefit from it immediately, as the other team can’t do anything in response without the risk of committing a penalty themselves, or at least be put at a wholly unfair disadvantage through no fault of their own. In critical game situations, this “strategy” could unfairly determine the outcome of the game. In sports, penalties are needed to punish teams who try to put the other team at some kind of disadvantage due to illegal actions. So players tend to not commit penalties, thinking “if I commit a penalty, my team will be put at an immediate disadvantage.” Penalties in derby are there for the same reason, but the pack definition rules allow a skater to realize, “if I commit a penalty, my team will be put at an immediate advantage,” that advantage being a free lead jammer call, or worse, free points for the jammer during a scoring pass, since the other team is legally disallowed to touch the opposing jammer. If we’re okay with saying it’s technically possible to do something bad and get something good out of it, that is a very, very bad precedent to set. Especially so for a sport that’s still trying to reinforce its legitimacy and distance itself from its illegitimate past. Because the only other “sport” that allows someone to do something illegal and benefit from it is WWE wrestling. So, if we are to accept that there’s something inherently wrong with modern derby rules, and that taking away minor penalties won’t really do anything to change the situation, what could be done to fix what’s clearly broken? As I explained in Chapter 2 of The Pack Problem, sports rules are written in a way to discourage players from committing penalties, because there would be little or reason you would want to hurt your team intentionally. Any intentional penalty taken for strategical reasons should still immediately put the other team at a greater advantage than the team that took the penalty. The penalized team may still indirectly benefit from it in a roundabout or silver-lining kind of way, but generally only if the team given the advantage does something to mess it up. Derby rules need to be rewritten in a way that makes sports sense. That is, make it 100% impossible to directly benefit from any penalty, intentional or not. Even if it is made so a team may be able to take a strategic intentional penalty, they should still be put at an immediate disadvantage as a result of the penalty anyway. The best way to do this is to not issue penalties to skaters who don’t keep the pack formed. Instead, penalize these skaters with a natural competitive disadvantage. That is, instead of punishing the action of not doing something with a whistle and a box trip, punish the inaction of not doing something by making it easier for the other team to score or easier for the other team to avoid being scored upon (no referee intervention required). That way, in any and all possible scenarios, the only thing a player can do to help her team win is to do things better than her opponents out on the track, as it should be. But the problem is, as long as the pack definition rule requires that members from both teams stay in the pack, it would be impossible for there to be a pack if one team (or one skater from a team, if they’re the only one in the defined pack) did something to accidentally (trip, get knocked out of bounds) or deliberately (skate out of bounds, take a knee, stop and let the pack drift away) destroy it. If there’s no pack, then there’s nothing stopping a jammer to get through it untouched and score. 4.3.3.1 The pack is definied by the majority (at least five if all eight blockers are on the track) of players skating in proximity. A skater who is 20 feet in front of or behind the closest pack member is considered out of position and out of play. Note that there’s no mention of the pack needing skaters from both teams in it; that provision (along with many others) was added in the next major revision to the rules, Version 2.1. But the thing is, that rule definition caused its own problems. If a team was down a skater in the pack, there was nothing they could do to speed it up or slow it down, since full pack of blockers on the other team—the majority—could either sprint forward or stall on the track, with nothing the other blockers could do about it. The pack is defined by the largest group of blockers, skating in proximity. If the pack is split between teams, the pack shall be defined as the group of team skaters at the front of the engagement zone, regardless of the number of skaters they have. In other words, the pack definition rule would be the same as it is now, but the split-pack/no-pack rule would no longer exist as there would always be a pack somewhere on the track: Either where it normally would be during normal play, or at the front during a team pack split. This would also mean both teams have a fair an equal chance to get to the front of the pack and speed it up, much like both teams have a fair and equal chance to slow it down by goating a blocker. In the future, I’ll have a more in-depth article as to why this would be a really good idea to implement this kind of pack definition rule in roller derby. But just as a quick proof-of-concept, what would happen if the rules were written that way during the Charm City/Windy City jam? Had the Windy City blockers elected to all line up out of play at the start of their power jam, they would have still been issued the illegal procedure penalties, and had one of their blockers sent to the box (under the beta rules). This would have then put Windy City at a 3-4 pack disadvantage, but still have them be on the power jam. Assuming Charm City could sprint around the first lap and catch back up to the the Windy City blockers with the Windy jammer still behind them, you’d ultimately be left with a similar situation to a regular jam start, with the pack all together and the jammer behind them. It would just be starting a lap further around the track than it normally would. But the key difference is, with Windy taking an intentional penalty and putting themselves a blocker down in the pack, it would now be a lot harder for Windy’s three blockers to hold back all four of Charm’s blockers from breaking out of the pack. Would that happen, Charm City would earn the advantage of being able to make the pack go as fast as they wanted to, because Windy’s three blockers could never define the pack unless they managed to seal off at least one of Charm’s blockers behind them, earning back the right to redefine the pack where they wanted it. In other words, the only way Windy would be able to prevent Charm from racing the pack would be the action of physically blocking and impeding the Charm blockers from getting in front of them and slowing it down for their jammer to catch back up. It would be impossible for any Windy inaction to slow down the pack or potentially take a strategical penalty to force a no-pack situation; that would only make it harder for Windy to score in that situation. So, instead of Windy City intentionally putting themselves at a pack disadvantage and risking a speedy pack that would earn few or no points on that power jam opportunity, wouldn’t it make more sense for Windy to line up all of their blockers normally and just try to get through Charm’s defenses by, you know, actually actively blocking them from the start with a full pack in the first place? I don’t understand how it’s on Charm moving forward to reform the pack. Both teams are on the same lap which puts Windy City behind Charm City, not in front. Shouldn’t Windy have to move forward and Charm have to move backward to reform the pack? Even if your description is the case. Shoudn’t Windy have been picking up a bunch of failure to reform the pack majors if they just stood there? 4.2.1 – Prior to the start of a jam, all skaters must be in position with the Blockers in front of the Jammers. In other words, the jammers are always behind all the blockers at the start, regardless of where the blockers line up. Even with Windy City’s blockers breathing on their jammer’s neck, because the blockers are required to be in front of the jammers, the Windy blockers were still technically in front of her and 100 feet ahead of the Charm blockers. For that reason, Windy could not skate forward after the start of the jam, since that would be an attempt to keep the pack split and a failure to reform penalty. And like Interrobang said, no skater is ever required to skate backwards on the track. Even in a situation like this, it’s still both teams’ responsibility to reform the pack. So Windy’s blockers were holding up their end of the deal by not stretching the pack out further. Therefore, Charm’s blockers had to do their part by skating forward to reform the the split pack that was 100 feet in front of them. It’s loopholes like this that makes me go mad with frustration. The pack is critically important to the competitive game of roller derby, yet it requires cooperation from both teams to hold it together. It seems like a good idea on paper, but in the perfect world, as we saw this weekend at ECDX, it just doesn’t work in the real world. You know what else requires cooperation, seems like a good idea on paper, but doesn’t work in the real world? In this case, it’s pretty obvious that the blockers are behind the jammer line (which is a phrase that is specifically used in the rulebook) and not therefore in front of the pivot line which would mean they’re behind the pack and not in front of it. I’m pretty sure that overrules 4.2.1. It’s worth noting that under current WFTDA rules, the lone blue blocker in the video you posted would get a major for every intentional pack destruction she commits, so she’s looking at maybe five minutes in the box. Derbytron: Picture the track spiraling upward, with each lap around the track putting a skater exactly above where she was a lap before. The very bottom of the track (for blockers) is the jammer line. They can’t go any further back than that. When Windy moved behind the Jammer line, they actually moved one level up on the track, making them 100 feet ahead of Charm, rather than the 30ft behind that they appear to be. As for Windy skating back, no skaters are ever required to skate clockwise. They are allowed to skate clockwise to reform the pack more quickly, but they are only required to not move further away. Here’s an out-of-left-field idea: Rather than redefining the pack, make passes by the jammer made under a no-pack situation the same as a “no pass no penalty”; that is, the jammer can neither score points nor gain lead when there’s no pack. The jammer is not penalized for passing players, but does not benefit from it, either. I can already see the manipulations in that too. Opposing jammer is coming up, either fall behind or jump ahead to break the pack and their scoring pass doesn’t count. There are likely a lot of different ways to address it, but everything will have the loopholes. Perhaps a major to the jammer in a case where the pack intentionally tries to give them the advantage by an illegal procedure at the start of a jam. Or even combine the “no pass no penalty” thought when a ref deems a blocker on the jammer’s team has intentionally broken the pack by falling or going out of bounds to give them the advantage. In addition to the penalty they would receive anyway. I’m still learning all the nuances of the rules, but this definitely seems like a couple areas that can quickly go from “manipulating the ruleset” to “being a d-bag”. The statement “Charm City could not have legally blocked her since they would have received out-of-play penalties for doing so.” is 100% incorrect. In WFTDA beta No-Minors, there is no penalty for blocking out of play except due to severity. Meaning, Charm could have legally blocked the Windy jammer all day so long as they did not knock her down or out of bounds. All they had to do was form a wall… done, and done. 6.10.13 Any blocking while out of play that forces the receiving opposing skater off balance, forward, and/or sideways, but does not cause her to lose her relative position. It’s also fair to note that in current WFTDA, 6.10.13 is a minor. The skaters *could* have chosen to take their minors to prevent Windy from getting lead jammer. In the case of Reforming the Pack, all Charm had to do was for one skater to veer off and bridge while maintaining a 3 wall. It’s not that difficult of a counter-strategy if you actually know and understand the rules. My parents taught me that two wrongs don’t make a right. But that’s effectively what you’re saying in your suggestion about what Charm *maybe* could have done, isn’t it? That one way to counter Windy’s illegal pre-jam formation (for which they received a penalty for, hence it being illegal) would be for Charm City to also do something illegal and receive a penalty for it? Sounds like a slippery slope. That a team should be forced to decide whether or not to intentionally take a penalty to counter a “strategy” wherein they are put at a competitive disadvantage–through no fault of their own–is unfair and utterly ridiculous. I want to watch people play roller derby. Not ruler derby. Enabling a pack defined by members of just one team would allow complete control of pack speed and position by a team that is one blocker up and enable some even more ridiculous situations that this one and the “jam that never was”. As it is WFTDA has dealt with this tactic with a new rule “clarification” enabling refs to issue a major and whistle the jam dead if theres not enough on track players lineing up legally to define the pack. Yes it doenst sort out some of the no pack situations during the game but often times those are where the real tactical battles take place. Knowing that knocking an opposition player down will destroy the pack and screw your own team is game awareness and tactical play. I do agree with the general principle though that penalty punishment should outweigh team benefit from commiting said penalty. WFTDA allow for expulssion for blanatantly deliberate illeagal blocks, maybe theres a case for allowing refs this opposition in extreme examples of deliberate breaking of other rules…it would lead to its own contentious situations though. Theres always a balance in not allowing refereeing to take over the game, and stopping teams becoming more concerende about drawing penaties than actualy playing the game. Like you say when it really comes down to it its down to the players to actually want to play the game. This is the case in many sports, the trick is to find a rule balance that encourages this and give refs some leeway to act when they see blatant acts of games(wo)manship. Fishcakes said: Enabling a pack defined by members of just one team would allow complete control of pack speed and position by a team that is one blocker up and enable some even more ridiculous situations that this one and the “jam that never was”. 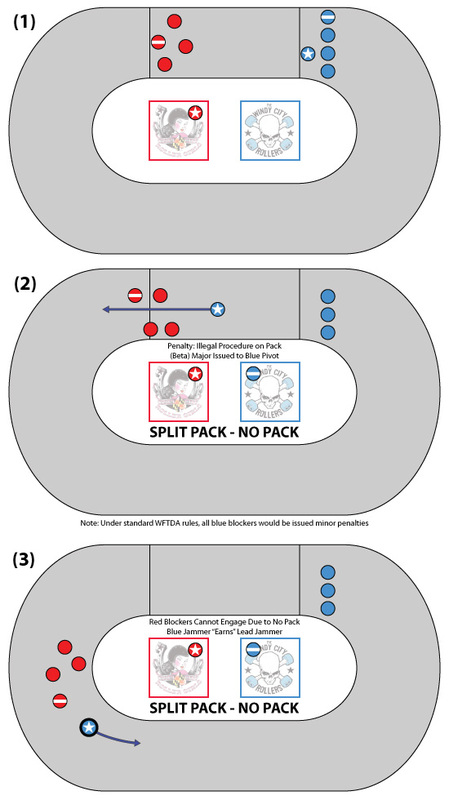 1) During a normal pack split (with blockers from both teams mixed in both halves of the split), instead of calling a no-pack, the pack would be defined as the blockers at the front, putting the blockers at the back out of play and unable to block until they skate forward to rejoin the pack. 2) During a pack split between teams, the pack would be defined as the team at the front of the pack, regardless of the number of blockers they have. 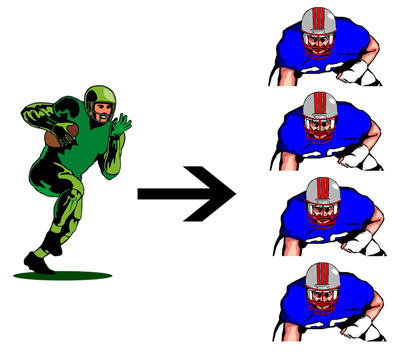 This means that a team down a blocker or two in the pack can still control the speed of the pack, because if they sprint away from the front, the team of blockers in the back will be out of play and unable to block until they catch up to the other team at the front. That means you can have very fast packs and a keep-away situation at the front (a valid defensive tactic back in the old days of derby), but it’s something wholly preventable by the team with the majority of blockers; they just need to, you know, actively block the other team at all times.